Organisations that implement effective manpower development and succession planning ensure business continuity while motivating and retaining their talent, rather than losing them. A number of organisations have approached manpower development and succession planning from a qualitative perspective and have unsurprisingly been less than successful. PROCLAD Academy’s Manpower Development & Succession Planning training course will enable participants to consider the latest methodologies and strategies related to successful manpower development and succession planning. The training course is also designed to provide tips for participants to create a clear career path. In addition, it will help delegates to plan a succession strategy for a flexible and sustainable business. 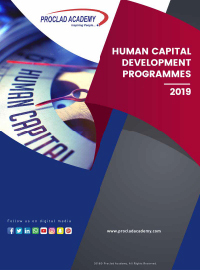 PROCLAD Academy’s Manpower Development & Succession Planning training course is predominantly designed for human resource professionals, line managers, HR business partners, team leaders and specialists. PROCLAD Academy’s Manpower Development & Succession Planning training course uses highly practical and experiential results-oriented methods based on an adult learning concept. It incorporates short inspiring lectures with structured lessons from the learning manual, captivating PowerPoint slides with videos to enhance learning, ongoing discussions with action planning, and ample time for Q&A. Participants are encouraged to share their organisational experiences in order to optimise the learning process.